You’ve Booked Your Hot Air Balloon Flight. But Do You Have Everything You Need? Complete our Balloon Flight Checklist and Make Your Trip the Best One Yet! Recently the Australian Ballooning Federation (ABF) released an article detailing the checklist pilots must perform to ensure that they are ready to safely pilot their hot air balloons. We applaud the ABF’s commitment to safety and realised that not many first-time hot air balloon adventurers are sure how to prepare for their ride. To help make the experience a breath-taking one, we’ve put together a couple of pointers you should consider before your next or first hot air balloon ride. Get a good night’s rest in, so that you’re awake and ready to see the splendour of the Australian countryside like never, before. Also, we suggest you make sure you’ve had a trip to the loo before we take off. Casual comfortable clothing is recommended, wear what feels comfortable to you depending on the season, don’t over dress in the belief it will be colder in the air as it is in fact warmer. The sun is rising, naturally warming the air, there is no wind chill as you are moving with the wind, plus you have burners above your head that act like heaters. Since hot air balloons often land in fields, we suggest you wear shoes and socks that can handle the terrain. No matter what the season, we always recommend that our guests wear sunscreen. There are no necessities you must bring along, except a sense of joy, seeing as you’re going to have the experience of a lifetime, but there are some items you can bring with you, if you like. Sunglasses often come in handy on a hot air balloon trip, as does a small camera or just your smartphone. (Remember to keep a tight grip on your valuables!) If you want to bring larger photographic equipment, contact us ahead of time to see if it will be possible to accommodate you. 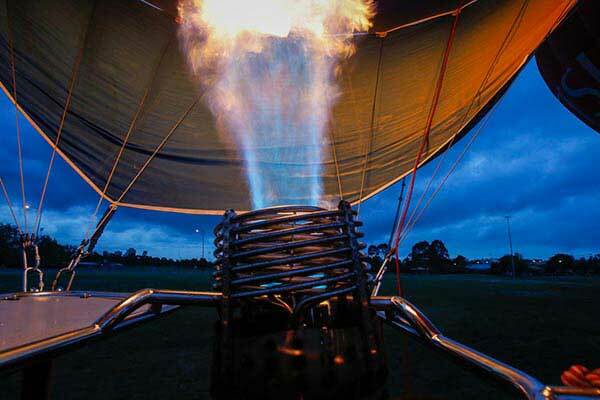 We are committed make every hot air balloon ride a safe and enjoyable experience for all our passengers. So, join us for your next hot air balloon ride, safe in the knowledge that we’ve taken care of all the important parts, and that you’re about to see something amazing! If you need any more information regarding hot air balloon safety and our commitment to your safety, or want to book your hot air balloon flight, don’t hesitate to contact us today!